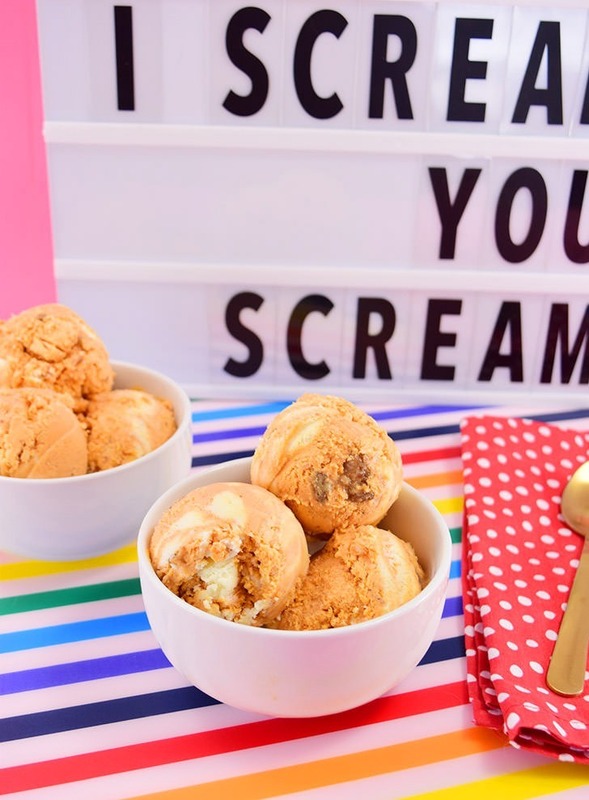 Okay so you’re like, 5 ice cream recipes in 5 weeks, what are you crazy? And the answer is, well, yeah, a little. I got this crazy idea to make some ice cream for the blog and it snowballed :) until I had almost a dozen containers of ice cream in my freezer, wait for it, 2 weeks before I was set to go on a Caribbean vacation where I’ll be hanging out in a bathing suit a whole lot if I’m doing it right. Yep, right before my first “big trip” I start whipping up lots and lots of ice cream. And you know what I decided? I don’t care. I really, really don’t care. Sometimes I get a belly and sometimes I get a little bit more than a belly and you know what, I’m still happy. And this made me think, you know what I love? Pumpkin pie. And you know that everybody says that pumpkin pie and pumpkin spice only belong in the fall, and normally I’d say they’re right, but these days, I’m a rebel, baby. And guess what… this rebel with an ice cream belly on full display at the the beach is gonna have her pumpkin ice cream and eat it, too. Because, guess what again, this stuff is frickin’ amazing. 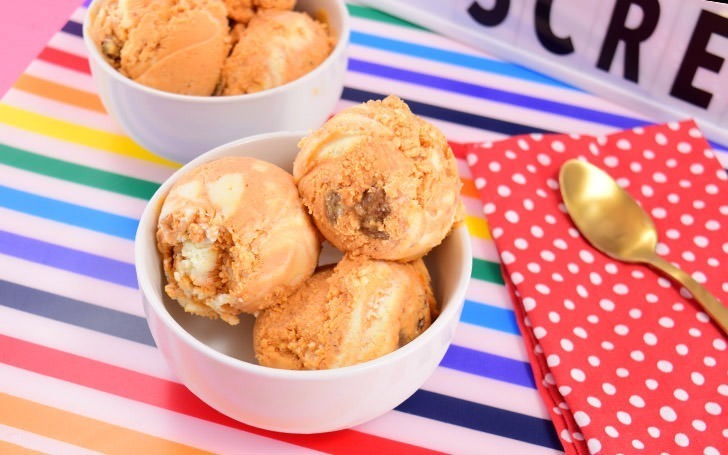 We’re talking amazing pumpkin flavor PLUS cream cheese swirl PLUS sweet, sticky praline pecans. It is like so, so, SO good. Like it’s kind of a problem it’s so good. So if you love pumpkin pie and you can say I’ll do my pumpkin spice whenever I dang well please, y’all, get that recipe below and get it. And maybe double it. ‘Cause this is a really hard one to share. 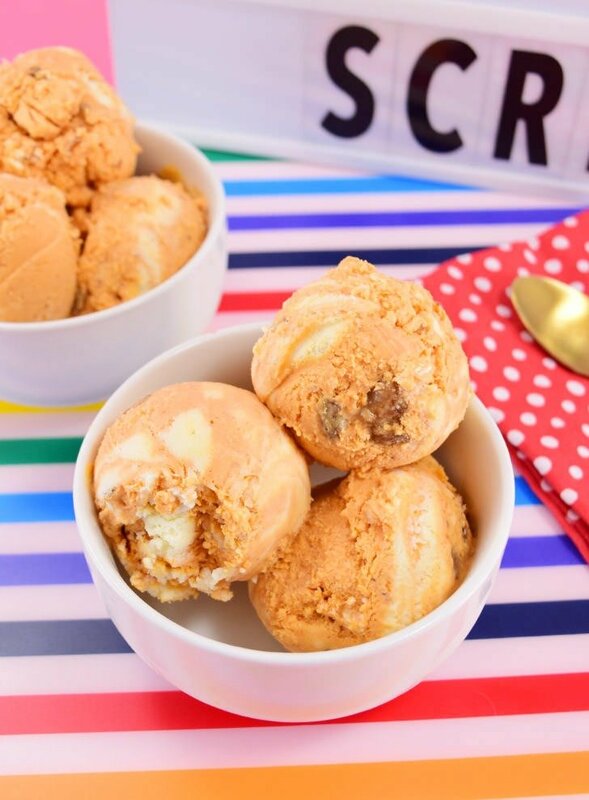 Any time of the year when you get that sweet craving for pumpkin, this ice cream will sate your appetite quickly and easily and with a fun, cool spin! In a stand mixer or with hand beaters combine heavy cream, pie filling and sweetened condensed milk until soft peaks begin to form. Spoon in a layer of pumpkin base in the bottom of a rubber container. Sprinkle chopped pralines and blobs of cream cheese mixture. Continue with 2 more layers of pumpkin ice cream, nuts and cream cheese ribbon. Take a butter-knife and gently swirl the ribbon in the ice cream. Seal the container and allow to freeze 4-6 hours, though overnight is best. Do you scream for ice cream? Because I totally do. Check out my other flavors below. p.s. that marquee sign from the pics is hanging up in my office and looks way creepy out of context. What an amazing recipe! I tried this a couple of days ago and we all loved it!